Influencer marketing has become a popular buzzword in the content community, with some brands joining the influencer trend while others hold back. In reality, almost any brand can tap into this form of marketing to increase exposure and generate quality leads. If your company has been on the fence about investing in influencer marketing, keep reading. This article will review why you should try to tap into influencers and how you can do it effectively within your industry and brand. Industry conference speakers like company CEOs or consultants have a large following and command large audiences at events. Professional organizations like the American Medical Association and American Association of Pediatrics represent large communities and speak for them when they address the nation. Blogs like Search Engine Watch are the first to report changes to Google, and marketers follow them to learn what those changes mean for their brands. Most influencer marketing campaigns start by identifying 10 to 20 experts that brands can connect to and form relationships with. By identifying the top influencers in your field, you can create a marketing campaign that engages them and gets the results you want. Blog content breaks down complex ideas to help readers better understand your industry. Content assures customers you know what you’re doing and will take care of their needs professionally. Articles give audiences a reason to visit your website and become more familiar with your brand. 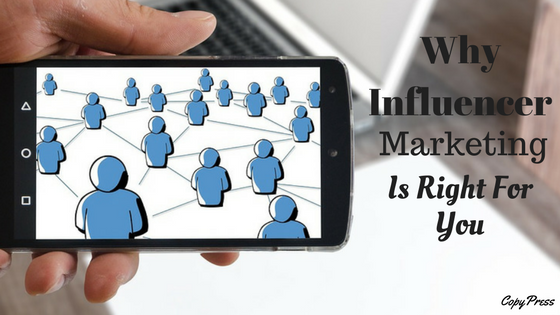 Influencer marketing helps with blog content in two ways. First, it generates traffic to your blog as the influencer promotes your brand and the content you create. Next, it allows you to create content without burning out, as you can collaborate with influencers to create amazing pieces. Suddenly, maintaining a blog and creating content seems much less intimidating — and much more profitable — with influencer marketing. According to the Weidert Group, 93 percent of B2B brands use some form of social media. This typically centers around at least one of the big four: Facebook, Twitter, LinkedIn and YouTube. Of this 93 percent, more than 70 percent of respondents use social media to distribute content. If you’re trying to use social media to engage audiences and drive traffic to your website, then influencer marketing can help. Not only will getting tagged by an influencer dramatically increase interest and awareness for your brand, it will also help you start a conversation online. If you only have a few hundred social media fans, then influencer engagement can boost your following dramatically. Influencer marketing can also help you create content to share. If your social media team struggles to find content that engages people, then collaborating with influencers will help them. Instead of just sharing blog posts and infographics, you can start sharing webinars, podcasts, and video interviews with influencers in their area. Your content will become more dynamic and appeal to different types of leads. If you’re still on the fence about whether or not influencer marketing is for you, consider the fact that brands have noticed an increase in the quality of the leads they generate from influencer marketing, not just the quantity. Joe Sinkwitz at Intellifluence reported that more than 50 percent of respondents thought the quality of their leads increased with influencer marketing. Only 10 percent of respondents felt their lead quality decreased. Essentially, if you use influencer marketing to drive traffic to your blog or website, you have almost a 90 percent chance of breaking even or increasing the quality of leads you drive. That statistic certainly reduces the risk factors and uncertainty of trying this form of content marketing. Influencer marketing improves the quality of your leads because your brand is creating quality content and forming strong relationships. Your brand isn’t using gimmicks to attract site visitors or expanding outside of your typical audience. Instead, you’re attracting the best possible people to turn visits into sales. According to MediaKix, influencer marketing has grown over 90 times more popular since 2013. Using Google Trends, the team found that “influencer marketing” received only 50 searches per month in 2013. As of 2016, the average number of daily searches was 4,400. This means brands and marketers across all industries are significantly more interested in influencer marketing and want to test it to get their own results. If you aren’t already using influencer marketing, then you’re probably already behind. Most marketers have had over three years to jump on this trend and work out its kinks in order to maximize value. Even if your industry lacks tech-savvy brands, tapping into influencer marketing can put you ahead of the game in this rapidly growing field. This statistic also proves the value of influencer marketing. Searches for the term keep growing because more brands have seen the success of others and want to duplicate it. If influencer marketing wasn’t successful, then it would have decreased in popularity a few years ago. You don’t have to start an expensive influencer marketing campaign and blow your budget reaching out to one top person. Instead, start by reaching out to a few small influencers and collaborating with them to create something cool. This will give you influencer marketing experience while boosting your audience’s engagement.